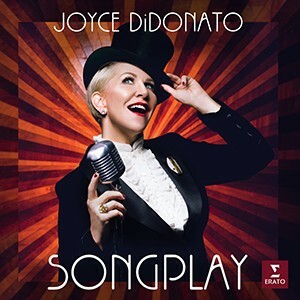 Con su nuevo álbum “Songplay“, Joyce DiDonato aborda una visión nueva y creativa de la música vocal, from the Baroque and Classical periods until the twentieth century. The 14 tracks de este disco se hilvanan exitosamente en un ambiente familiar pero inesperado. Songplay It offers music of Vivaldi in Baroque purity and playing with her samba rhythm. Sparkle tango incorporates an aria Marcello, contemporáneo de Vivaldi o emplea el lenguaje de Bach en la pieza Lullaby of Birdland de George Shearing. “Songplay, As its title, It suggests exactly what it is in itself " – afirma el pianista Craig Terry, creator of this musical project with Joyce DiDonato – "We have chosen iconic pieces for students of classical singing but we have tried to give a new format. La intención original de la obra permanece”. El corazón de Songplay lo configuran arias y canciones breves y aparentemente simples, written mostly in Italy in the eighteenth century in "book learning" for students of classical singing. “When Craig and I interpret our selection of baroque pieces for this album, a voice in my head told me: 'But if this aria (You know it), It composed in the seventeenth century, expresses the same yearning Solitude Duke Ellington, written in 1934 '. In that sense, I felt it was the same song. So, while we played this music, I thought it would be amazing to unite both genders, antica aria and American folk songs, and demonstrate so essentially we have been singing the same repertoire for 400 years. Simply, required to musicians eager and willing to try new things to tell stories. " Craig Terry: Pianist and harpsichordist. Es el Director Musical del Ryan Opera Centerin the Lyric Opera de Chicago. The original idea of ​​this album, next to Joyce, He departed from him. Lautaro Greco: Argentine bandoneon player and tango teacher. His recordings include collaborations with artists like the unforgettable Mercedes Sosa.